Is the FBI Sitting on a Massive October Surprise for Donald Trump? Subject: Is the FBI Sitting on a Massive October Surprise for Donald Trump? The outspoken Democrat issued a scathing public letter via his own website to FBI Director James Comey yesterday (Sunday). 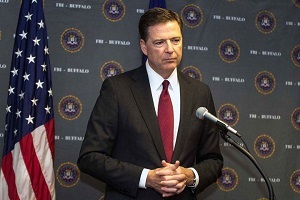 He criticized Comey's disclosure last Friday (Oct. 28) that the FBI is reopening its investigation into Hillary Clinton's emails based on new evidence the agency recently obtained. Reid's scathing memo accused Comey of "partisan actions" and even suggested he "may have broken the law." This latter statement is in reference to the Hatch Act of 1939, which bars the use of an executive branch position to influence an election. The senator also dropped the bomb that the FBI and national security experts possess "explosive information" about ties and coordination between Russia and Donald Trump and his campaign. "In my communications with you and other top officials in the national security community," Reid wrote, "it has become clear that you possess explosive information about close ties and coordination between Donald Trump, his top advisors, and the Russian government – a foreign interest openly hostile to the United States, which Trump praises at every opportunity." Reid then pointed out the "disturbing double standard" in Comey's treatment of sensitive information between the Democrats and the Republicans with a "clear intent" to aid one over the other in the 2016 presidential election. "You rushed to take this step eleven days before a presidential election," he wrote, "despite the fact that for all you know, the information you possess could be entirely duplicative of the information you already examined which exonerated Secretary Clinton." To be clear, there is no public evidence to support Reid's claim of actual collusion between the Trump campaign and the Kremlin. Were that to be the case, it would be a scandal of epic proportions — one for which there's actually no clear precedent. Its aftermath would be uncertain, at best. Should such "October Surprise" evidence emerge from the FBI about this alleged Trump-Russia connection eight days from Election Day, Trump could be disqualified from the presidency were he to win the public and Electoral College vote. As for Comey breaking the Hatch Act, should he be found guilty of doing so, he'd likely lose his position and his federal salary and pension, but would not serve hard time. Follow us on Twitter @moneymorning or on Facebook. Senate.Org: In Letter, Reid Says Comey "May Have Broken the Law"
Money Morning: Are Russian Hackers Selling U.S. Cyber Weapons Online? As if Harry Reid has any credibility. That lying, obstructive, Obama mouthpiece will not be missed. Clearly, the FBI agents investigating Weiner had to read each of his e-mails to determine whether they were relevant to his case. For those e-mails relating the Clinton's tenure at State, these agents still had to read them to determine whether they were relevant to the Weiner case. Although they never received a subpoena to investigate these e-mails as they relate to Clinton, they still had to read them as they relate to Weiner. Consequently, these agents know what is contained in those e-mails relating to Clinton. Were they duplicative, Comey would not have asked for a second subpoena to investigate Clinton. Nice try Harry, but we will not fall for your disinformation. Harry Reid appears to have created another lie, just as he did against Mitt Romney and when it was proven that he had lied (after the election), he simply said, "He didn't win did he." Harry is a crook and should have been indicted more than once. He is now a multi-millionaire after he had entered politics with very little money. His insider information has treated him well. Harry Reid lied about Mitt Romney's taxes. Then admitted he lied and bragged about it after the election. They don't call him DIRTY HARRY for nothing.